Clump forming species for woodland and shady places. British and European native this species grows in deciduous woods and damp meadowland in sun. In the garden it will grow well in simlar places, so, shade in most soils, sun if not too dry. Tightly clump forming at the root, they make a rounded clump of often shiny leaves to c. 30cm and the flowers stand well above the leaves. Flowering in late spring they usually only flower once but can re-flower later if the summer is not too dry. 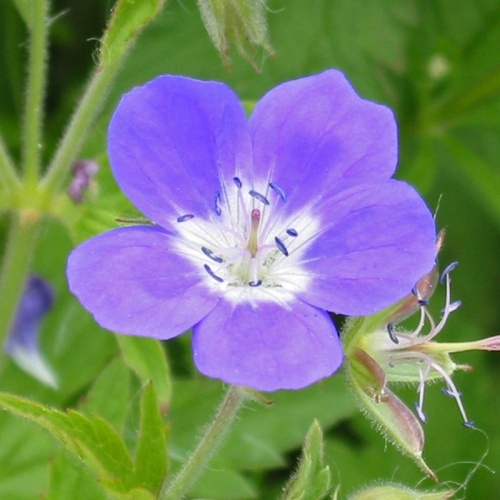 Geranium sylvaticum flower colour tends to vary according to where it comes from. From our experience; blue-purple are typical British plants, pinkish purple Scandinavian, pale pink central and southern Europe and bright reddish pink south-eastern Europe. 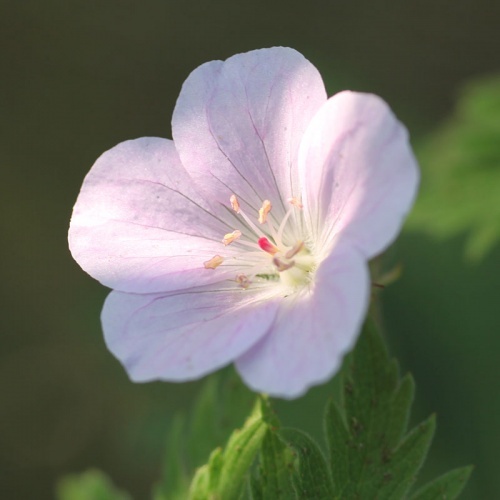 There are a small number of hybrids of Geranium sylvaticum with other species that require similar conditions. 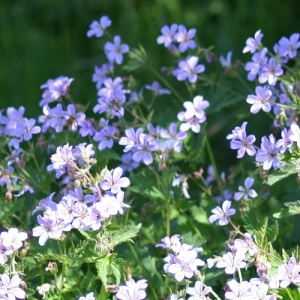 Masses of small blue flowers in spring. Alan Bremner's hybrid: a compact clump of leaves and the myriad of flowers are held erect for weeks in late spring. Open or light shade, not too dry. 70cm. Choice cultivar with brilliant deep blue flowers. Later. 60cm. For shady or open position and drought tolerant but will give better results with humus and moisture. 45cm. Pretty pale pink flowers on this strong grower to 75cm. Found by Bill Baker in Switzerland. Good soil in light shade or shade.